Today I'm part of a collaboration blog hop between two of my absolute favorite companies in the craft world. Chibitronics and Winnie & Walter. I have stalked followed Winnie & Walter since the start and I adore their wonderful products. And I found the perfect sets to pair up with some fun Chibitronic lights and effect stickers. You can enter the giveaway by commenting on the blog posts along the way. You have until 11:59 PM CST next Tuesday, May 29th in order to be eligible for the giveaways. Chibitronics are giving away a $30 starter kit so you have everything you need to start making fun interactive cards with lights. Winnie and Walter are giving away a $30 gift certificate for you to spend on their lovely products. Good luck! 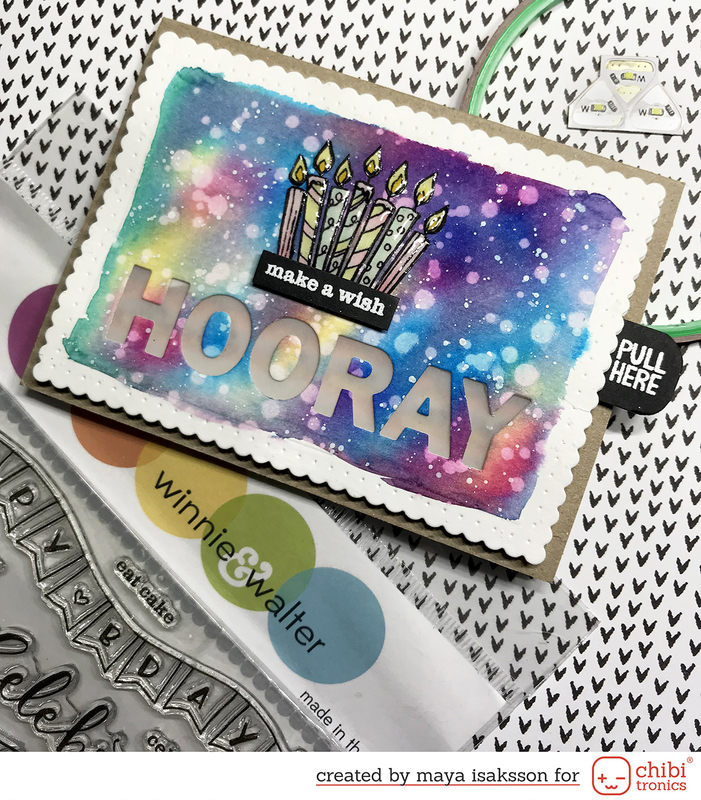 I totally fell for the birthday themed stamp set called Wish Big with Evelin T Designs and I found some dies, In a Word: Birthday Tiles Cutaways, that was to die for. Sorry, couldn't resist it! The big birthday words were perfect to make a window with lights behind with and to add some extra fun I used a blinking effect sticker. To use an effect sticker is not hard at all. Just connect the negative side of the battery to the - on the effect sticker and then on to the - on the LEDs. The + side of the battery (the top) goes to the + on the effect sticker. Then another connection from blink on the effect sticker and to the + side of the LEDs. My picture of the inside was after the foam tape was added and it looks super messy so I drew a picture of the connection instead. The switch is of the type you pull out to start the lights. I have gotten the idea from Eiko on the Chibitronics team, it's pretty brilliant, here's a picture from a previous card to show you what it looks like. 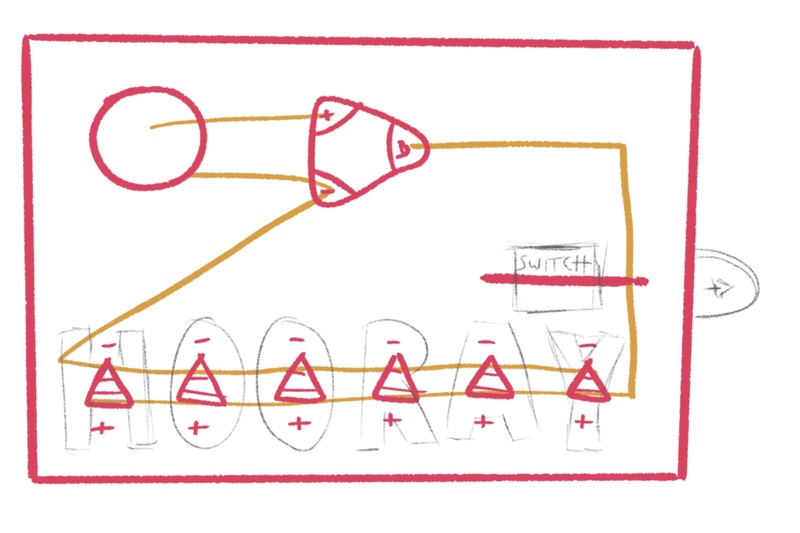 So the switch is in the shape of an X and the copper tape goes around it to connect both sides of the cut circuit. I find that it doesn't drain the battery as easily because there is no connection before you want it. A regular push switch sometime connects when something is put on top of it or when you mail the card. Now hop on to the incredible Vanessa Amann and see what she came up with. If you get lost on the way, here's a list of all the stops. Have fun! Can I just say : FAVORITE!!! I love the bright colors of your card and when you light it up... wow! WOW! Outstanding use of the Chibitronics light and W&W stamps! What a fantastic card. Thanks for the idea and the video. How cute Maya - and it blinks... so cool! Love your watercolor rainbow back ground - super fun! What a fun and happy card. The light up hooray is awesome and you created a stunning background panel. That is so so pretty. Your background is stunning! And love the light up word! I have now just become hooked.. this looks simplify than I thought they would be. How fun and festive, I like the colors and shine and the cool light up feature. Beautiful background and awesome card! Oh my!!! Flashing!!!! I love this card! What a treat it would be to receive this. Awesome card, thanks for the chance to win and sharing. Wow!! this is so magical...Love it.. So bright! Love the watercolor background. What a fun card to get on one's birthday! Thanks for sharing! This is a beautiful card! I love the vibrant colours! Oh I love this to light up the whole word!!!!!! That's what I was thinking all along the blog hop and you did it perfectly! Thank you for the tutorial and help to do one myself!! Hooray for all the bright shining light! This is so much fuN! Love the bright colors! 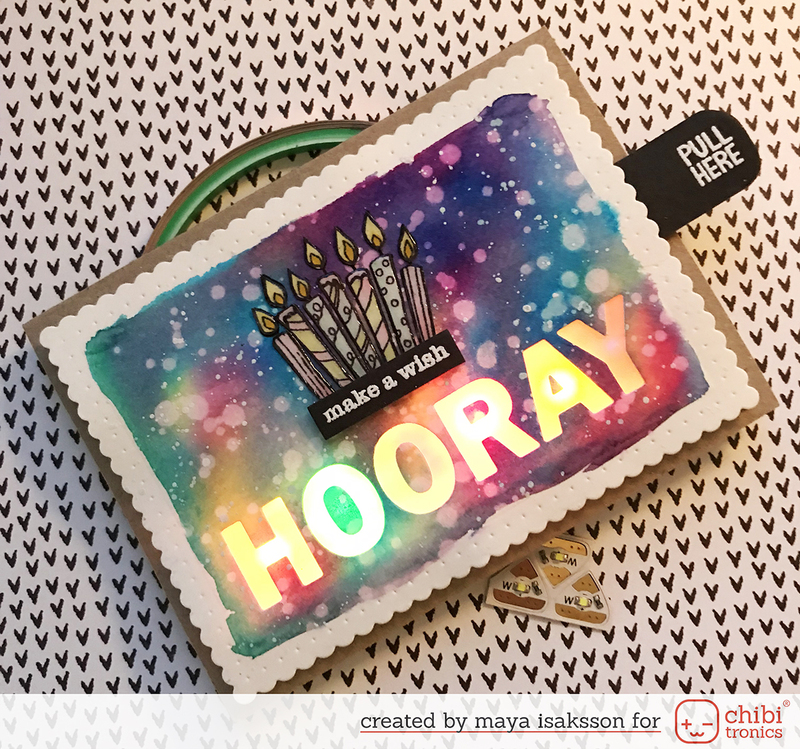 I love the rainbow colored background and the fun light-up sentiment! 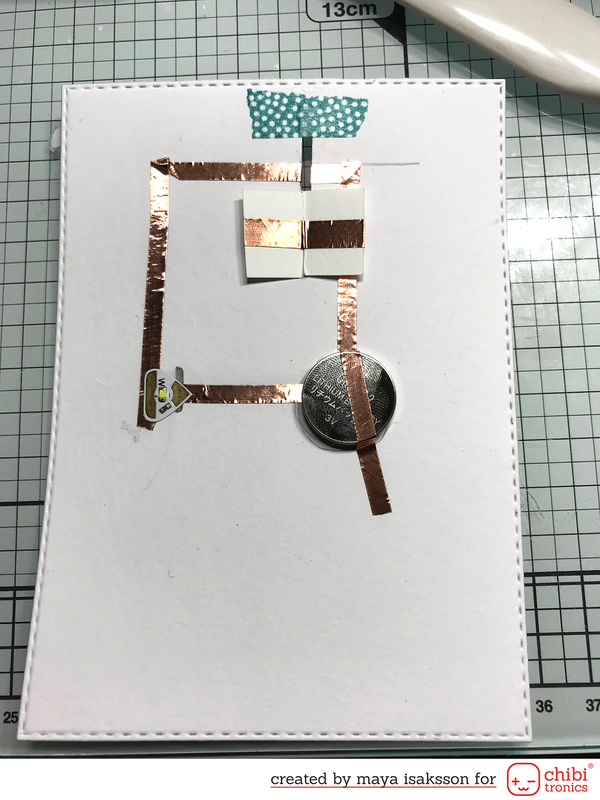 I'm really itching to try Chibitronics after seeing your fabulous card! Over the sentiment lighting up! So cool! Love the candles on the card. Thanks for the video. I would have had no idea how you did the card otherwise. It really helped! Gorgeous background on this great card.